Meanwhile, members of the religious Jewish Sect in the West African country of Nigeria are in a mood of frenzy about the news. The President, Goodluck Nathaniel is a senior member of the sect. Just last week, he appeared on the American T.V Station, Cable News Network (CNN) declaring that the self-acclaimed ‘Giant of Africa’ is considering making the baby a crib for a present. 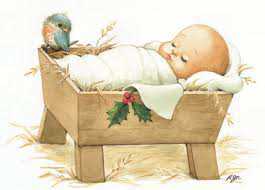 Hear him, “It is not going to be just any crib. It is going to be the world’s biggest crib. The Ministry of Interior Decoration have contacted some of the world’s finest construction firms and we are going to make a crib as big as the World Trade Centre of blessed Memory.” This news is coming on the heels of the country’s failed attempt to make the world’s biggest cake at its fiftieth Anniversary, but the President is not perturbed. “We know we made a mistake, but this time, we shall get it right!” he enthused. The President isn’t the only one planning to welcome the Messiah. All around the Western African country, posters, fliers and billboards have been circulated and erected with the inscription, “Bomboi Jesu…9ja loves you!” The President’s wife is reported to be organising a high delegation of women groups to visit the child, all dressed in customised Ankara with the inscription, “Messiah, 9ja’s first Lady loves you. Na U b d Koko!” In the Neighbouring country of Ghana, President Jacob Zuma-Rock has hinted what should be expected of them. “We are sending the boy and his mother five hundred million cedis (C500,000,000). I mean FIVE HUNDRED MILLION CEDIS.” Some few years back, that amount would be five hundred naira (N500), Nigerian currency. In Russia, the story is spreading like wild fire. Usmarov, the world’s richest man was featured in this month’s issue of Forbes Magazine. The multi-billion dollar rich oil mogul revealed he is aware of the birth. “I have heard of it,” he said in an Exclusive interview. “And I think its great news for the world. I mean, we have waited for it for like how long? – Six thousand years? Geez, that’s like forever! I am just happy it is happening during my time. I could invest in that area, who knows?” The wealthy billionaire however, didn’t reveal how he intends to invest in the boy’s birth. “It is top business secret,” he said.